Ask Tom Hayes what he thinks about southern Lebanon and he’ll tell you straight: “It was hotter than the hinges of hell.” Ask again, and he’ll tell you that he “dropped 20 pounds in six weeks.” But if you ask a little more, you’ll learn about the long and tragic history of the Palestinian people, and the small hope that storytelling and ﬁlmmaking could bring them. Tom Hayes is a professor and resident Editor-in-Chief at Ohio University’s Film Division. He teaches and guides OU students through the post production process of narrative and documentary ﬁlmmaking. 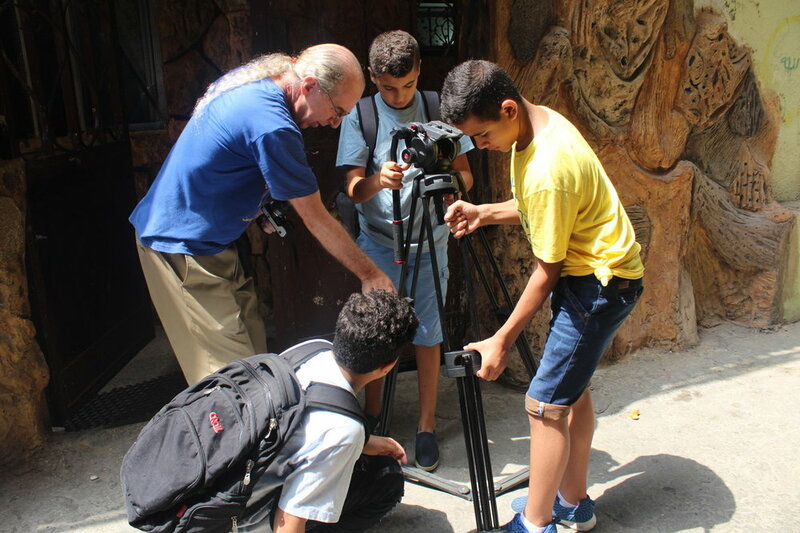 Also a ﬁlmmaker in his own right, he has spent nearly four decades traveling through Lebanon, Palestine, and Israel to ﬁlm and document the situation of Palestinian and Syrian refugees in the Middle East. Tom has decided that it’s not enough to point a camera at the refugees – you have to hand the camera to them. Tom reﬂects, “every now and then, artists had a real impact on the course of human events.” He talks about Uncle Tom’s Cabin and Huckleberry Finn in America, or Cry the Beloved Country in South Africa. Tom has made three documentaries on the Palestinian situation: Native Sons: Palestinians in Exile, and People and the Land are available as free downloads here: https://vimeo.com/ user9363542. His most recent documentary, Two Blue Lines is available on Amazon and iTunes.